Jonathan's adventures continue in the second volume in the trilogy! ..Dr. Solly has very cleverly woven together a social history of seafaring in the post-war years... ...you discover just how well the author ... has captured the experience of being at sea. ...a wonderfully evocative read, and an important contribution to the history of the period. 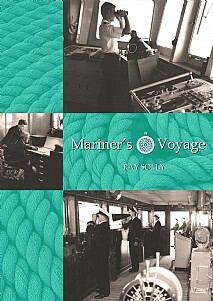 Mariner's Voyage is the second volume in a trilogy which offers a socio-historical and semi-autobiographical account of seafaring during the 1950-1970s, a 'golden age' of British shipping. It relates to a new generation the significant economic and social changes of the time, providing an insight into a way of life now overtaken by events. This story continues the adventures of Jonathan Caridia, the narrator in Mariner's Launch, and shows his continued professional and social growth. Written in an eminently readable style which encourages empathy with the narrator, the reader shares Jonathan's pride at leaving behind his cadetship and experiences his uncertanties when he joins his first vessel as Third Navigating Officer. Jonathan impresses as a very real person encountering new challenges and some dramatic situations, which he handles responsibly and with increasing confidence. The reader learns how he confronts new challenges and handles his responsibilities, often conveying a laconic, dry sence of humour. Seafaring then was more leisurely than today, yet Mariner's Voyage is not only for veterans but is also a must for younger readers and all who enjoy rattling a good read. Seafarer's expectations today may have changed a little, although computerisation requires different skills, but going to sea will always be exciting. The sea remains a demanding and challenging taskmaster for those navigating vessels and does not suffer fools gladly. This true-to-life adventure story of a young man's development in his maritime career will ring true with many seafarers, being appreciated by veteran and young sailors alike. It also gives a detailed and enjoyable picture of the 'golden age of shipping' and will be of great appeal to all maritime enthusiasts and armchair sailors.